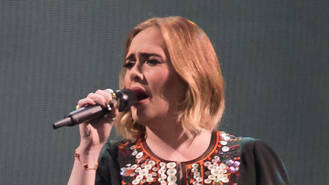 The Rolling in the Deep singer is close pals with the presenter, and he has revealed that while she achieved global success with her album 21, Adele was still "cut up" about her ex-boyfriend and once stayed with Alan for days after turning up at his house "completely inconsolable" over the split. "Adele stayed with me when she was at her lowest ebb," Alan writes in his book Alanatomy, which has been serialised in The Sun newspaper. "The album 21 had just taken the world by storm but you would never have thought it with how miserable she was." Alan offered her his spare room for a rest and would leave tea and sandwiches outside the door but she didn't surface for days, leading Alan to worry she had passed away. "She was quiet as a mouse, so quiet in fact we forgot she was up there, and it was only after a couple of days that I realised we hadn't seen her or heard a peep out of her," he explained. Alan's now-fiancee Paul Drayton suggested they check on her but the presenter was concerned about what he would find. "My brain went into overdrive," he revealed. "First things first, we had to check whether she was dead after all. Paul and I walked up the two flights of stairs and there she was sound asleep and, thankfully, alive." Alan and Paul got engaged during a recent holiday in Indonesia and he has already asked Adele to be his bridesmaid. He also hopes she will sing her hit Someone Like You at the ceremony. Adele has since got over her heartbreak and has been dating Simon Konecki since 2011. They have a three-year-old son named Angelo.